Carolyn Relei Designs. 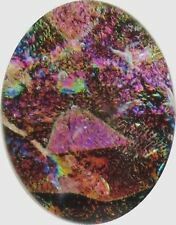 Exceptional High Quality Hand Made Fused Dichroic Glass Cabochon Bead (flat back, no stringing hole). Fused Dichroic Glass Cabochons. Dichroic glass is difficult to photograph. Pictures do not show the depth and sparkle as viewed with the naked eye. 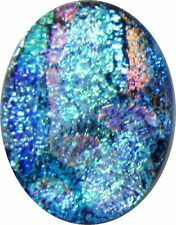 Dichroic Cabochons Premium Lot Of 12. This is a very nice assortment of coe 90 cabochons showcasing mainly cobalt blues, whites and turquoise with multicolored dichroic accents. A lot of dichroic on these! Use in jewelry making - pendants bracelets etc. Also could be fused into other 90 coe glass... Thanks for looking and good luck if you bid! The tiles you receive are the ones shown in the photos. These smaller pieces are great to use for Jewelry Focal Pieces, Wire Wrap, PMC, Pendants, Earrings and as accents in Tile Backsplashes or Drawer and Cabinet Pulls. This set has 30 handmade ROUND and SQUARE dichroic glass cabs (15 pairs). Sizes from 12mm to 14mm. All glass works are handmade by us. no bail, no hole and flat-backed. I've been a glass artist for more than 25 years. My work has won awards and has been published in four books on glass. I've made thousands of glass cabochons to set in my hand-fabricated jewelry and have made hundreds more cabs than I can ever possibly set. DICHROIC GLASS. Used for Jewelry Making. Lot of 5 pieces. >Wander through my Gallery, but don't wait to long to make a decision. >All of my Art and Collectables are from my personal collections. These are Cabochons (flat backed, no hole beads). 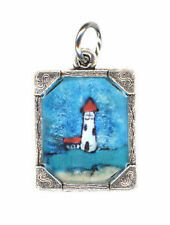 To see other stunning Glass wearable art Cabochons. 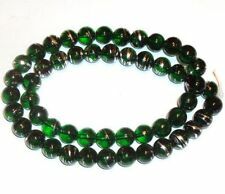 The actual beads will be as similar in size, shape, and color as possible. Each sheet of Dichroic Glass varies. They could be also used as small pendants.These cabochons are 1 1/2" long or 38 mm in length. They are all flat backed and are ready to be made into beautiful Earrings or pendants by simply gluing on Aanraku (or similar) Bails. Radiating with color and a rainbow sheen, solid color glass beads with all-over coating. Smooth, transparent colored glass with iridescent AB coating that is scratch-resistant even with frequent use. Carolyn Relei Designs. These cabochons are a single dichroic color, capped with clear. Unlike the complex cabochons that are my specialty, these have a little ring of uncaptured dichroic glass around the base. Color: Golden Yellow AB. Size: 20mm. Special Finish: Aurora Borealis (AB). Appearance: Radiating with color and a rainbow sheen, solid-color glass beads with all-over coating. Glass Beads. Be Dazzlin Beads. This set has 16 handmade dichroic glass cabs. no bail, no hole and flat-backed. All glass works are handmade by us. You can add your own earring backs and make 12 pairs of dichroic earrings. My work is cold worked and fire polished at industry standards and have nice clean edges. I use Bullseye 90 COE glass and CBS Dichroic, so if you are a glass artist you can fuse them on future glass projects as long as you use a glass with a COE of 90. Smooth, transparent colored glass with iridescent AB coating that is scratch-resistant even with frequent use. Crystal Clear AB Glass Beads. Approximate Size: 20mm. Special Finish: Aurora Borealis (AB). Smooth, transparent colored glass with iridescent AB coating that is scratch-resistant even with frequent use. Special Finish: Aurora Borealis (AB). Approximate Size: 3mm. This bead available in a rainbow of colors & sizes from 3mm to 20mm while supplies last. Color: Aquamarine Blue AB. Smooth, transparent colored glass with iridescent AB coating that is scratch-resistant even with frequent use. Special Finish: Aurora Borealis (AB). Approximate Size: 12mm. Color: Aqua Blue AB. Radiating with color and a rainbow sheen, solid color glass beads with all-over coating. Smooth, transparent colored glass with iridescent AB coating that is scratch-resistant even with frequent use. Smooth, transparent colored glass with iridescent AB coating that is scratch-resistant even with frequent use. Special Finish: Aurora Borealis (AB). Glass Beads. Shape varies between beads. Be Dazzlin Beads. Smooth, transparent colored glass with iridescent AB coating that is scratch-resistant even with frequent use. 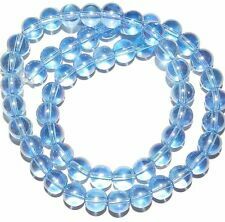 AB Glass Beads. Special Finish: Aurora Borealis (AB). Approximate Size: 12mm. Glass Beads. Beautiful Pearlescent Color Coatings For A Beautiful Finish. Glass Beads. Be Dazzlin Beads. Beads vary slightly in shape, size and color. Shape: Round, Slightly Oval.Plus crafts and finished jewelry. Each bead and each strand is slightly different and unique. Glass Beads. Be Dazzlin Beads. Shape: Round. Glass is solid color throughout.Plus crafts and finished jewelry. Color: Green. Size, shape and color may vary slightly. 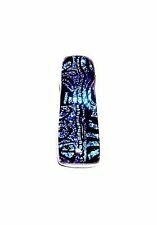 Smooth, transparent colored glass with iridescent AB coating that is scratch-resistant even with frequent use. Color: Light Blue AB. Special Finish: Aurora Borealis (AB). Approximate Size: 10mm. Glass Beads.